Tony Taylor was a great man of the theatre. A master of his craft, he directed over 80 plays, opera, musicals and a mass in a 50-year career in New Zealand. He loved actors and changed lives. During his sojourn he launched the careers of many of today’s actors. Tony was an author, designer, playwright and frequently cooked up a storm in a kitchen that always seemed to be full of thespians. His wife, Ianthe, and their children, Simon and Dominic, were throughout his busy life his staunchest supporters. Because his love of theatre knew no boundaries, they often found themselves working alongside him. Whether in the theatre or in the garden or the kitchen, his vision was always the gold standard to be arrived at with minimum pain and maximum joy and laughter. The beginning, Hawkes Bay, the first full-length production was a great success: Look Back in Anger, John Osborne. It received huge critical acclaim. Louis Johnson (critic and N.Z. poet) wrote the Hawkes Bay Herald headline: “Bitter Raucous Play Hits Hastings.” After that, Tony never looked back. Following the O.E. came the Papatoetoe Players, a day job as registrar for the court, and then, at the prompting of Don Hutchings, Tony’s first fulltime position as director, at Radio Drama in Christchurch. Radio was the bulwark upon which careers in the performing arts were built. It functioned as a school and hothouse for talent and gave some financial security for what was even in its halcyon days a perilous and competitive profession. From radio in Christchurch, Tony moved to Wellington and the purpose-built studios of N.Z.B.C. Here the family were adopted by Davina Whitehouse who became and remained honorary grandmother to the children. 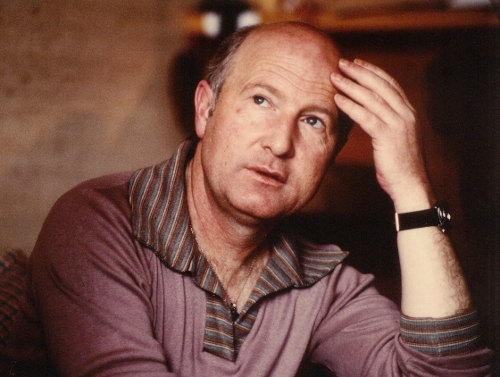 Here also, Tony first encountered Robert Lord, a playwright whose work he championed. In 1976, Tony was appointed artistic director of Downstage Theatre. His vision was inclusive and expansive. His conception was of a theatre responsive to the community and engaged politically and artistically with the questions of its age. He and his associate director, designer, Raymond Boyce, formed the most versatile, exciting, adventurous and productive artistic collaboration in N.Z. theatre history. In six years, they worked together on over 20 productions. Highlights include Travesties, Candide, The Rivals, Bingo, Heroes and Butterflies, The Seagull, The Merchant of Venice, Hamlet and Big and Little. The smooth course of events at Downstage was interrupted when, in 1981, director and designer, Taylor and Boyce, found they had the theatre to themselves, the acting company having gone out in support of technical staff during nationwide strikes. Theatres closed throughout N.Z. Theatre never fully recovered from this manifestation of good intentions. In 1982, Tony left Downstage to take up a scholarship to travel to and study in Germany awarded by the D.A.A.D., the German Academic Exchange Service. It was the first time this prestigious scholarship had been given to an artist. It had up till then been the exclusive preserve of scientists and academics. The Germans, as a result, automatically conferred on Tony the title, Herr Doktor Taylor. His highest academic qualification had hitherto been U.E. On his return to N.Z., Tony took on the Fortune Theatre in Dunedin. During his tenure as director, the theatre was transformed, as Downstage had been, seeing an unprecedented expansion of its activities into Theatre in Education (T.I.E.) and youth theatre. Tony’s productions include Chinchilla, A Midsummer Night’s Dream, Tales from Hollywood, as well as his adaptation of the classic A Christmas Carol. The Fortune era ended abruptly when the theatre’s board sacked every member of the company – twice – on the same day. As You Like It, which had been in rehearsal at the time, was expeditiously bumped into Allen Hall and was a further notable success. Tony moved to Christchurch, where, along with several guest directing spots at the Court Theatre, Torch Song Trilogy being a highlight for many in the company, he was invited to direct the stageshow for the N.Z. pavilion in Brisbane at Expo 1988. Developed with John Densem, that show became Onztage and played to packed houses. In the same period, Tony involved hundreds if not thousands in the largest theatrical event ever staged in N.Z., Bernstein’s Mass, at Auckland’s Town Hall. The 90s brought a move to Blenheim, where, at the family home of Addiscombe, Tony reinvented himself as chef and king of the homestay experience. Freelance directing work continued and Kempe’s Jig was formed with Barbara Barton and Pam Logan, a T.I.E. company dedicated to presenting Shakespeare’s plays re-imagined for youth audiences. Tony wrote, directed and designed the Kempe’s Jig repertoire, including Lear, Macbeth and Twelfth Night, which toured schools from 1991-1994. Tony’s health problems began when a medical misadventure at Blenheim hospital left him with permanent nerve damage. In spite of the pain, the work continued, now from Auckland: As You Like It in Blenheim, Spreading Out in Auckland; novels, short stories for radio and children’s books; a return to kitchen duties in Riverhead running the Kauri Gum Country Store and Café. Going with but against the grain again, Mr. Taylor refused to put standard fare on his menu and instead baked all the café’s breads, brioches and muffuletta. Offers to direct dwindled, however, even as the desire did not. Health complications ensued and compounded, leading to Tony’s premature death on April 24 at age 72. He remained until he died a creative and inspiring force and it was finally his family, extended, honorary and inclusive that he said was the best thing he’d ever done. At a Memorial Service in Auckland many of his friends from the theatre turned out in force. The tributes flowed for over three and a half hours of joyful memories and humour. He now lies at rest at Kaukapakapa Cemetery. Tony Taylor, born 2 January 1937, died 24 April 2009, is survived by Ianthe Taylor, Simon Taylor and Jo Larkin, children Millicent (her mother, Tanya Fraser) and Zachary, Dominic Taylor and Liliele Ahken, their daughter Iris.